I am thankful and proud to include the Malpass family in my circle of friends. Not only was Andrea Malpass my son's 1st grade teacher, but my daughter and Taylor Malpass share a love of horses and became friends while riding at Spring Bank Stables. Over the years, my family has grown to love this family and are some of their biggest fans! I encourage you to spend an evening at the Paramount listening to their music. You'll see why I enjoy them as much as I do. The Malpass Brothers’ annual concert at the Paramount Theatre will feature the world premiere of the documentary about the band and their hometown of Goldsboro. The film shares the story of the brothers’ devotion to preserving traditional country music and how our Goldsboro community’s support has helped them pursue their dream since they were young kids. 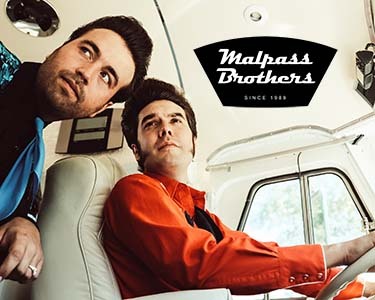 The Malpass Brothers are as authentic as stone-ground grits, country ham & red-eye gravy, hush puppies & chopped pork barbecue… and they’re every bit as good. It doesn’t matter if you’re already a fan of classic old-time “real” country music when you take your seat. You will be by the time you leave the hall. As young boys, Christopher and Taylor Malpass soaked up the music of their granddad’s phonograph records. Christopher earned his first talent show trophy at age 7, and Taylor was playing mandolin by the time he was 10. Today, they promote the work and music of classic country artists they treasure while creating new music and making their own mark in the lineage of a rich American cultural heritage. They have toured the country with the late, great Merle Haggard and have been honored to to appear with other country music celebrities in their travels. All of the members of the Malpass family are a real joy to get to know. Chris, Taylor, Chris, Sr., Linda, and Andrea.....they are all warm and friendly and it is obvious to me that they truly enjoy providing entertainment to those who are willing to listen. You owe it to yourself to enjoy this musical treat!